expert answers or insights from people recently touched by adoption. parents should know along a path to adoption. adoptive parents to meet the child they long to adopt. What will I learn from Lifetime’s Adoption Webinars? Are you thinking of adopting a child? Choosing to grow your family through adoption can be an exciting, yet overwhelming time. Every adoption starts with questions and research. Lifetime’s Adoption Webinars offer future adoptive parents the tips and direction about the steps involved to adopt successfully. Every month we offer new live events and relevant webinar replays to help hopeful parents better understand the adoption process, prepare to adopt safely and smoothly, and find encouragement along the way. It’s easy (and fun!) to attend Lifetime’s webinars live and you can listen-in by phone or participate online using a computer or your mobile device. Learn more about attending webinars here. To watch one of our many replays just click here. 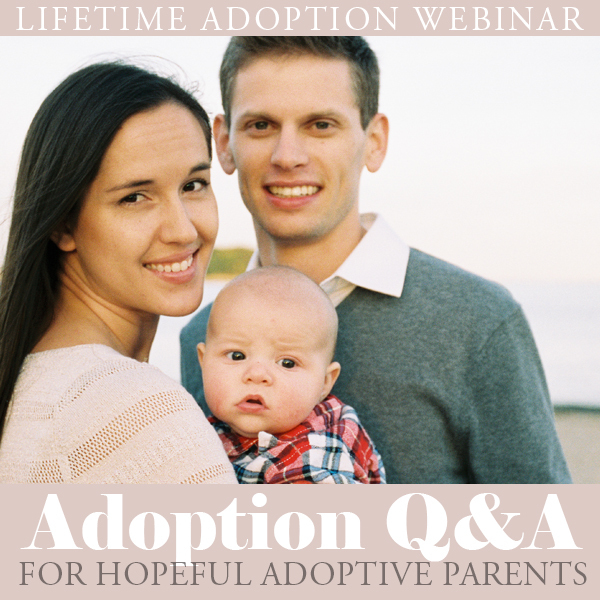 Each webinar is hosted by Lifetime’s experts who are familiar with the requirements, questions and challenges adoptive parents face, and we always make time to take questions from our live audience. This means you’ll learn from Lifetime’s professional experience, from people with their own personal adoption stories, and from the questions and comments of other hopeful adoptive parents in the audience! What do adoptive parents say about Lifetime’s webinars? View more webinar feedback here. Find out for yourself how Lifetime’s Adoption Webinars will help you reach your adoption dream! Start your family’s path to adoption today!